GM learned the hard way that simply branding a Chevy as a Pontiac isn’t the best way to maintain a business case. As a result, the Pontiac brand got axed along with the already dying Saab and Hummer brands (RIP Saab – love, a true fan). 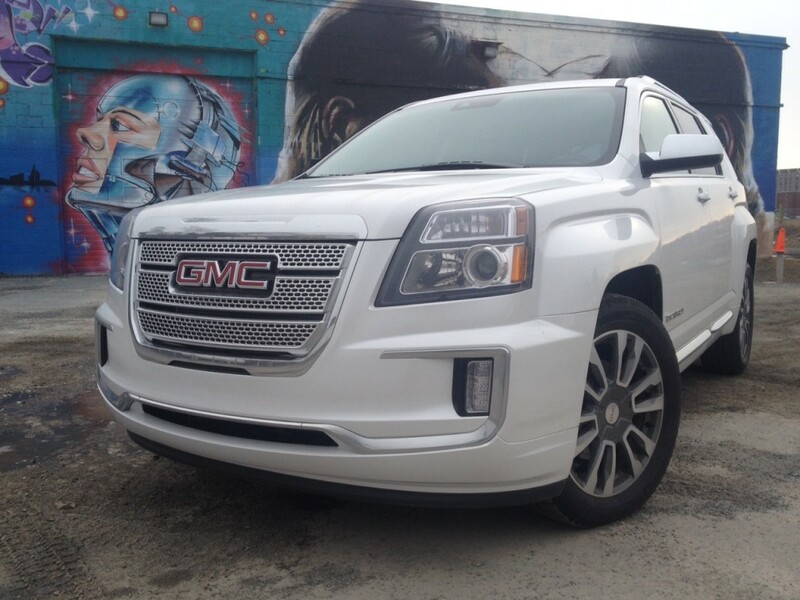 But interestingly enough though, they kept GMC despite every product in its lineup being essentially a re-badged Chevy. The difference, and what GM is likely banking on for GMC’s continued success, is that GMC offers a bit more premium version of the Chevrolet models. That’s especially true when the model is equipped with the top of the line Denali trim – now available on every GMC model. 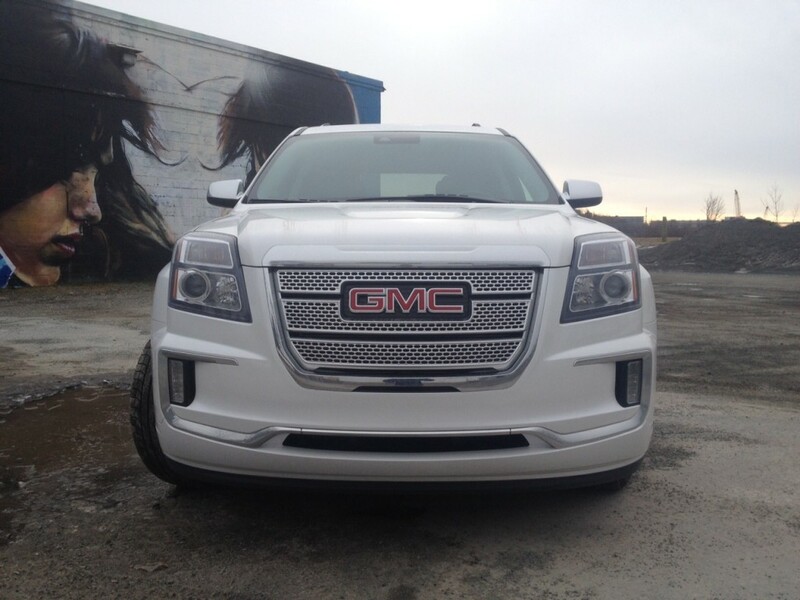 GMC recently refreshed the smallest member of its family, the Terrain. The term ‘small’ is used loosely since it is actually among the biggest in the segment it competes in, but GMC is hoping this refresh will keep it relevant until a complete redesign is done. Has it worked? I drove one to find out. I’m going to be completely honest. I was never a fan of the Terrain’s styling when it debuted back in 2010. I found its chunky styling awkward and the squared off fender flares just downright ugly. The thing is, I apparently am not the targeted audience for this vehicle. As it turns out, women tend to buy the Terrain more so than men and apparently the appeal of the styling plays a factor. Women seem to find the look rugged. Chalk that up as yet another thing I don’t understand about women, but I digress. Regardless of your gender, you’ll be forgiven if you can’t immediately pick up on the exterior styling changes GMC has made. 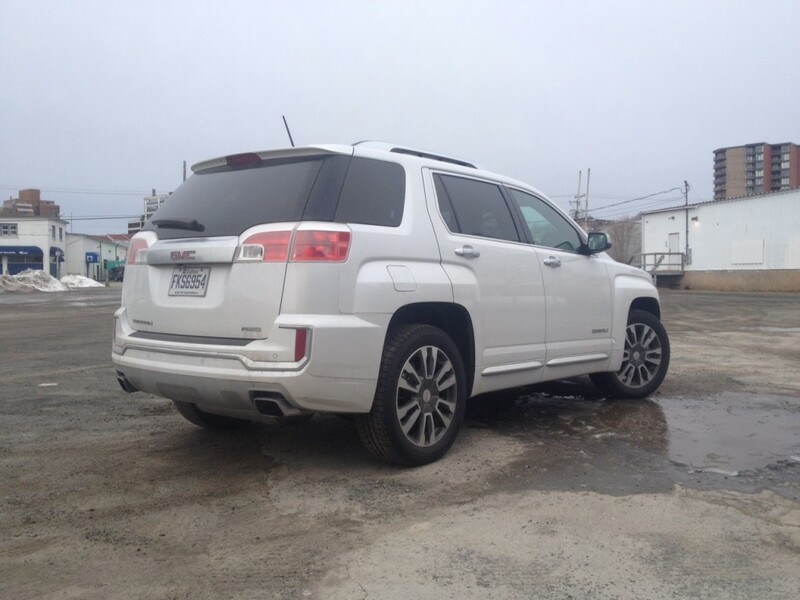 They are quite subtle but they include LED daytime running lights, new trim on both the front and rear bumper and new wheel options for the Denali. That’s about it. 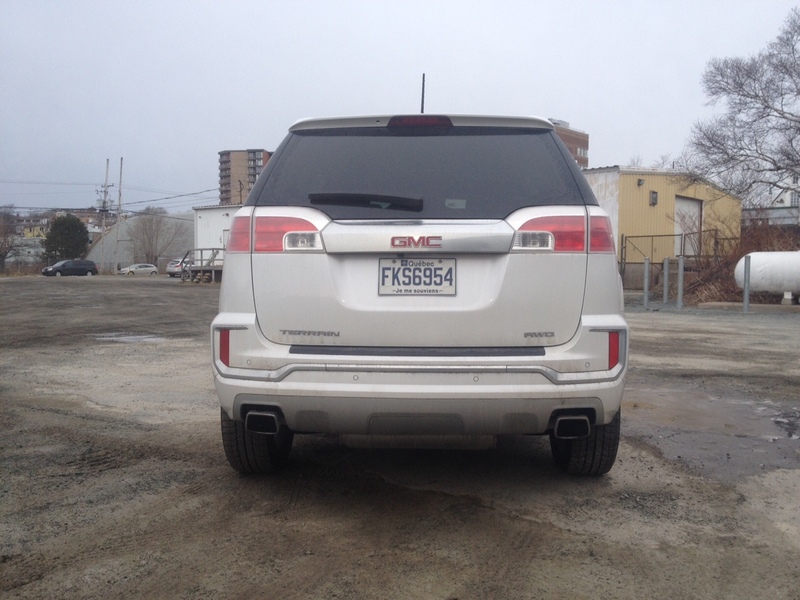 The Denali gets trim surrounding the top of the tail lights, but that isn’t new. 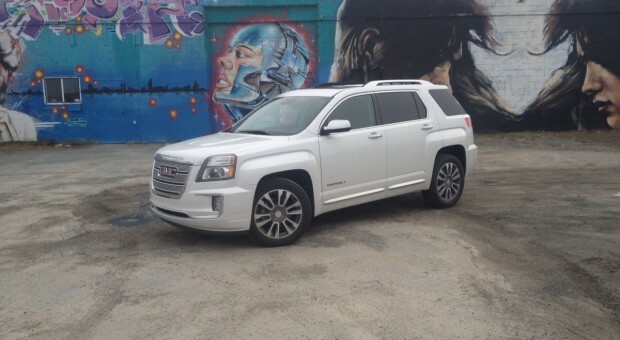 I was prepared to declare that GMC needs to do much more than a mild refresh to keep the Terrain competitive, especially since mid-cycle refreshes these days are more like complete redesigns, but the Terrain still got plenty of attention when parked – both from men and women. It might have something to do with the sparkling white tri-coat paint which gleams in the sunshine. Inside there isn’t much change either and it feels dated as a result. 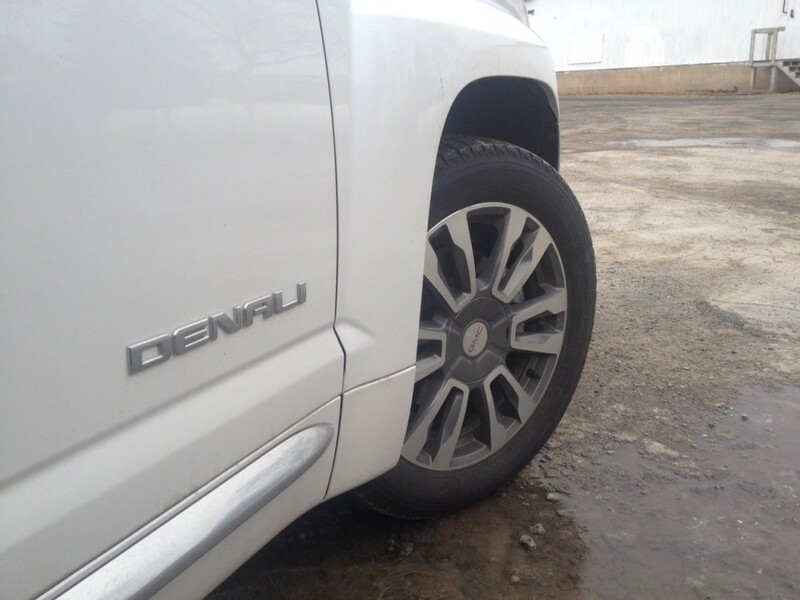 That isn’t to say that there aren’t luxury touches you’d expect in a Denali, but the design itself feels drab. The centre console is re-worked slightly but it is angled making is still too far a reach from the driver. Also, the red digital screen in between the gauges is a bit tough on the eyes. Luckily the quality of materials are good and GMC’s intellilink system is fairly straight forward, if a bit delayed sometimes. I mentioned that the Terrain is among the biggest in its class and that is apparent in the interior. There is no shortage of headroom and leg room no matter which seat you are relegated to. 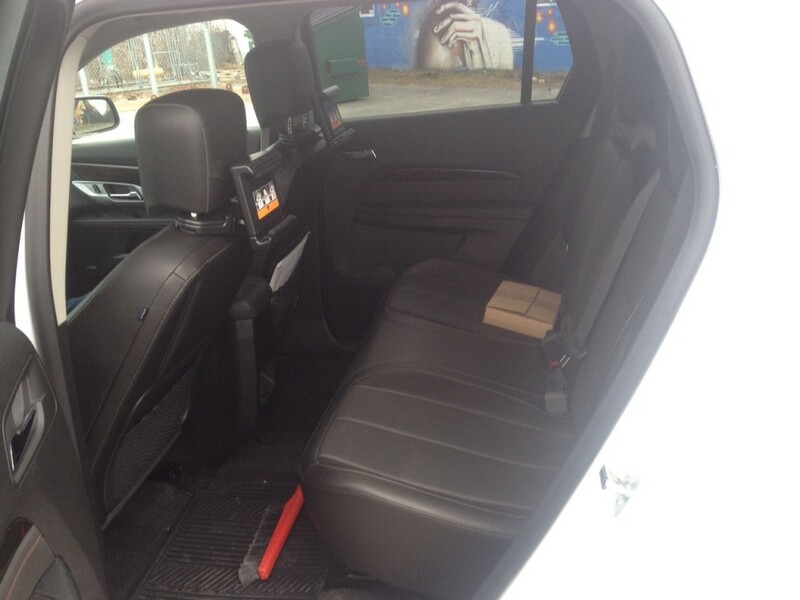 The rear bench can slide forward to increase the smallish cargo area. You have the choice between two engines in the Terrain: a 4-cylinder and a 3.6 litre V6 which is standard on the Denali trim. This unit produces 301 horsepower and 272 pound feet of torque. An available V6 in this class is quite the rarity and is plenty powerful but that doesn’t necessarily mean it’s fast. The V6 is mated to a six-speed automatic which hangs on to gears far too long, however shifts are relatively smooth once the transmission gets around to it. There is a good amount of low-end torque for good pick up when driving around the city. As mentioned, the Terrain isn’t the quickest off the line, but there is decent power and it translates nicely on the highway. That experience is enhanced with a very comfortable ride which can be attributed to the dual-stage dampeners found only on the Denali trim. The end result is not having a care in the world if you meet a pothole, however as you’d expect, it decreases the Terrains athletic abilities. As a result, taking corners can feel floaty and the effortless light steering does it no favours as well. 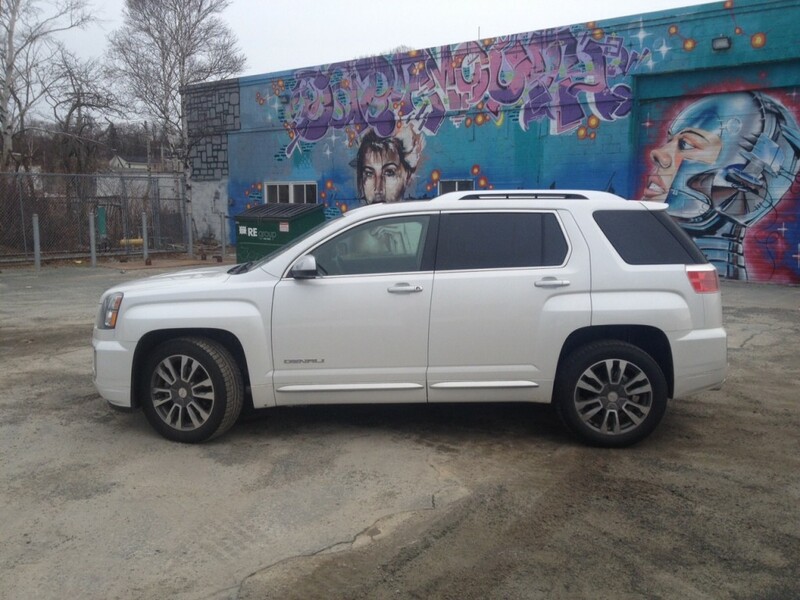 But chances are, if you are looking for the premium ride and feel you get from the Denali trim, you probably won’t care much that it doesn’t handle like a BMW. 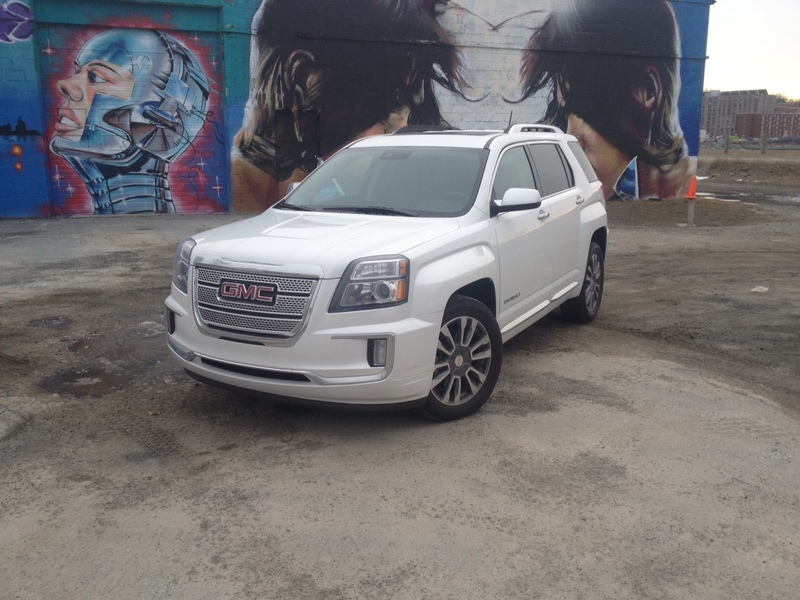 Around down, the Terrain doesn’t feel cumbersome to drive or park. As mentioned the light steering wheel provides for a relaxed driving style as does the travel of the throttle before you actually get moving. There was lots of brake travel as well and the brakes felt spongy but that could be due to the fact that the Terrain had just under 10,000 kms on it when I got the keys. Regardless, I found myself having to depress the brake pedal a lot harder to get it to stop where I wanted it to stop. If this is your main concern then you should probably overlook the V6 altogether and go with the 4-clynder because the on paper numbers for the V6 aren’t exactly impressive: 14.9 L/100 kms city and 10.1 L/100 kms highway. With that being said, I returned 13.9 L/100 kms in real world mixed driving so comparatively that isn’t so bad, but on the whole, it’s no fuel miser either. And to be honest, it’s no premium vehicle either. Sure it may look the part and have luxury appointments here and there but it’s lacking a lot of key features for a $50,000 vehicle. There’s no LED or HID headlights available, no proximity detection with the key fob, no push button start, no panoramic sunroof, no heated steering wheel and so on. 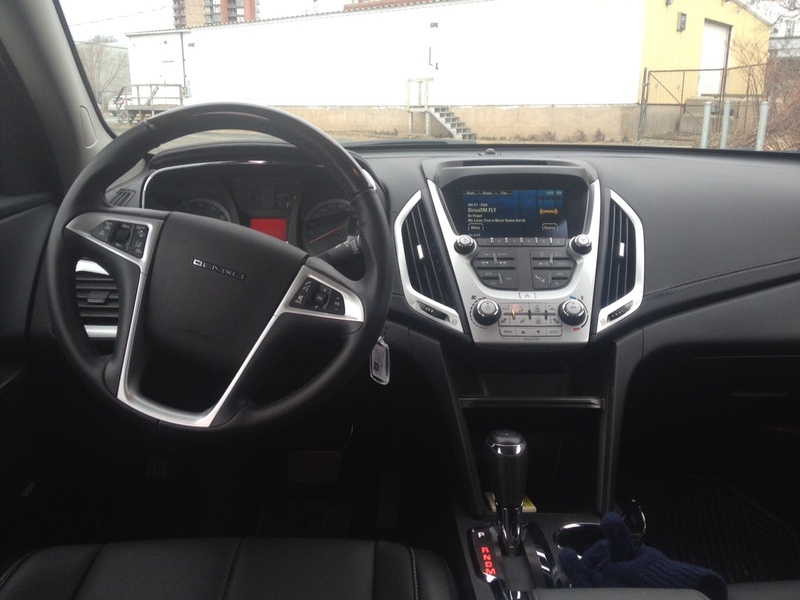 This is part of what makes the Terrain feel dated in addition to the exterior and interior design. Quite frankly, there’s better value out there for the same money.